>Birdman is an extreme departure for writer/director Alejandro González Iñárritu. In films like 21 Grams and Babel, Iñárritu postulates that all of humanity is interconnected by violence. He is praised and chastised for beautifully shot and immensely depressing movies, which is why Birdman is such a breath of fresh air. The tone is deliciously dark and funny without sacrificing consequence. It’s also very intimate, taking place almost entirely inside a theater and centering around a select few characters. Iñárritu employs clever editing to make the handheld camera work look and feel like one continuous take. The soundtrack too, is minimalistic, consisting simply of jazz drumming to accentuate the staccato dialogue volleying between characters. 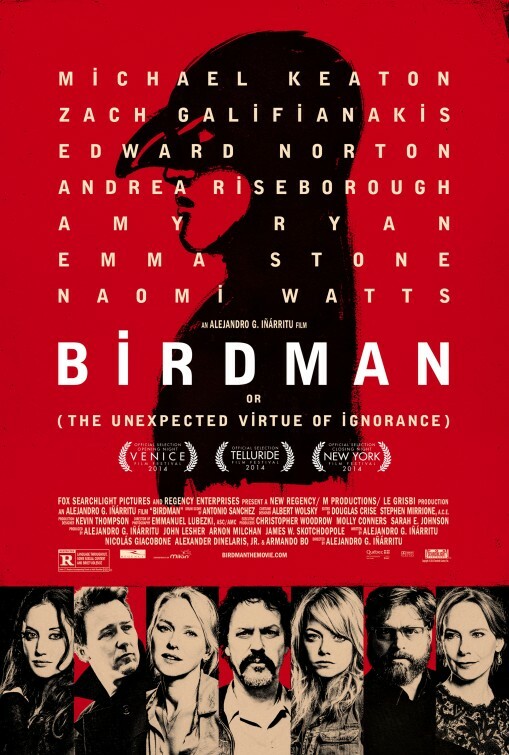 It’s this brilliant marriage of cinematography and score that makes Birdman unlike anything I’ve ever seen, setting a tone that allows its cast to both satirize and romanticize the subject matter. 9.5 out of 10 stars.